Two weeks ago, I laid out the economic argument for induced demand: the idea that building more roads does not reduce congestion. It is a simple model that uses concepts from Economics 101 to explain the relationship between road construction and driving behavior. Even so, this idea, like many associated with new urbanism, challenges the status quo. As such, there’s pushback. To ensure that no falsehoods go unchallenged, I decided to examine the claims in two articles that seek to discredit induced demand as a property. The first is a blog post from the Cato Institute written in response to a Wired article on the subject published last month, and the second is a Weekly Standard story written three years ago (which is still fresh in urban planning time). Here are the four most prominent false assertions upon which the articles rely. On average, driving grew more than twice as fast as lane miles. But in Boston between 1983 and 1993, freeway capacities grew by less than 1 percent, while driving grew by more than 35 percent. In Madison, capacities grew by 35 percent, while driving grew by less than 20 percent. The wide range in differences between urban areas suggests that, not only are Duranton & Turner’s elasticities wrong, their standard errors are far too low. Duranton & Turner’s headline finding was that the elasticity of demand in the transportation market is 1, according to roadway data from 1980 to 2000. In other words, holding other factors constant, a 20 percent increase in roadway miles elicits a 20 percent increase in vehicle miles traveled. “We found that there’s this perfect one-to-one relationship,” Turner told Wired. The Texas Transportation Institute’s annual Mobility Report, for instance, demonstrates an uncanny correlation between capacity and traffic congestion: Areas that add capacity tend to have lower levels of congestion. First off, that’s not what the the authors of the Texas Transportation Institute’s Mobility Report found. Instead, they wrote that “additional roadways reduce the rate of congestion increase,” which is a substantively different assertion. Plenty of academically-minded people before me have established the economic model. For one, Douglass B. Lee Jr. at the World Bank provides a more rigorous explanation. A meta-analysis of induced demand studies by Robert Cervero in 2001 found strong evidence of the existence of the phenomena, though different researchers have established different elasticity quotients. Recently, Duranton & Turner derived an elasticity of 1 with a very low standard error. Interstates according to writers at the Cato Institute and the Weekly Standard. A metropolitan area typically has about half as many jobs as people. But, because of geographical constraints, not every job is accessible to every person. 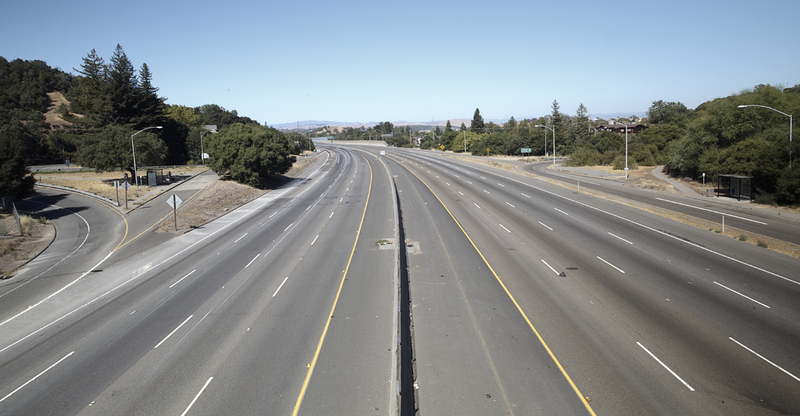 Highways are, far and away, the most efficient way of delivering people to a job. Portland’s dense development patterns yields $2.6 billion in yearly savings, which amounts to a 3.0 percent income bump relative to the average citizen of the United States. Automobile congestion as a result of publicly-subsidized highways costs Americans at least $45 billion every year. [Principal at Demographia Wendell Cox] maintains that the entire framing of the issue is faulty: “Latent demand” for a highway, he notes, isn’t actually a desire to drive on that stretch of road. People only want the road as a means to an end. “Transportation is not a primary activity,” Cox explains. “There is no ‘love affair’ with the automobile. Driving is not something we would choose to do.” […] In other words, a metric like “vehicle-miles traveled” is only superficially important. For a more intuitive explanation of induced demand, see this insightful post from Greater Greater Washington on how building public roads to fill “latent demand” is like putting out more and more free hamburgers to feed people. *Elasticity of demand is the percent change in quantity divided percent change in price that measures responsive consumers are to changing their behavior given a price increase. This quantity can be visualized by the slope of the demand line. All transportation system usage is in some way induced demand–if not, we’d all be trying to get to work on indian paths. The real question is whether the new trips are frivolous (i.e. they do not contribute to better quality of life/ economic growth). Accommodating growing demand through added capacity (Woodrow Wilson Bridge Reconstruction in DC, for example) can be beneficial to the region’s economic vitality and quality of life. Building new capacity in outer suburbs of regions with little growth (i.e. Cleveland) may induce trips in those areas, but these will likely mean a corresponding decline in other facilities– which clearly does not add to quality of life or growth in the aggregate. I see a difference between opening a bottleneck (Wilson Bridge) and simply adding highway capacity. Whether you add lanes in an already developed area or in a greenfield area, you’re going to induce demand. In highly developed areas, it makes more sense to add capacity in the form of more efficient transportation, usually rail. It takes up far less space overall than a 6 or 8 or 14 lane highway and can move many more people for the space it uses. It’s also much more scalable as demand increases. Meanwhile, I does not add pollution or require as much eminent domain. Both are wins for quality of life. One of the key factors in “inducing demand” in areas of new roads, is new development. The issue should be controlling or limiting development in areas served by new roads, rather than attacking the new roads themselves. If you put in a new road to eliminate congestion, and then allow haphazard development along the length of it, well, duh, its going to increase traffic. Finally, the equation has to take into account population growth and subtract that from the increased elascity. Perhaps it already does to some extent, but I doubt it. Population growth nationally keeps skyrocketing and, for apparent political reasons, is no longer considered a policy concern or problem. This must have an impact on road use and congestion.